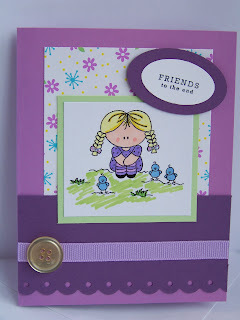 My friend Melina hosted a swap over on SCS - make a card for the 3 other ladies in your group using their favorite colors. Fun! I decided to make the same card, 3 ways. Image is from Softpencil and they are all colored in with Bic Mark-Its, Prisma markers and Copics..
Also, if you have a chance, please check out my friend Jenny's new store - she's selling the cutest little Bildmalarna stamps! Also, check out the Paper Jewels blog! The design team's creations will begin in February and I am so excited to be a part of it! 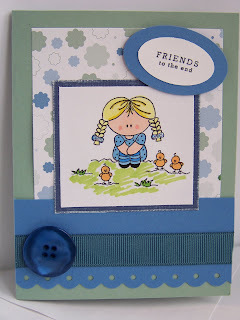 Very cute cards, love the dp! Ver cute! Love this image and you used some great colors. How adorable and thoughtful. Love the idea of creating the same card. I did three different. Think I might do this next time. Super cute cards!! 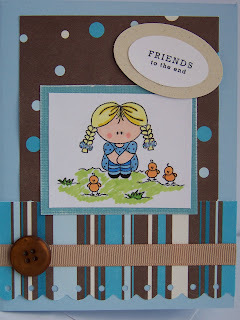 Such cute cards- and great color schemes. These are great....love the color combos on all of them and love how different a little color change can make to the same design! !